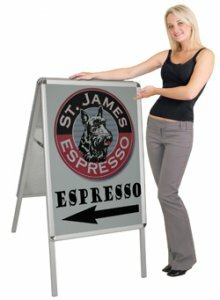 Synergy double-sided aluminum frame includes snap edges for quick graphic changes and a silver anodized finish. Synergy can hold a 23.5" x 33.5" graphic. Price includes two inserts printed with your design. Synergy double-sided aluminum frame includes snap edges for quick graphic changes. Synergy has a silver anodized finish for a clean durable look. Synergy can hold a 23.5" w x 33.5" graphic (plus bleed). Price includes two inserts printed with your design.